Here is everything you need to know as a seller who is selling product(s) on an online store. Following are the steps which help a seller to start selling his products on a multi-vendor e-commerce marketplace. You can manage products in the Products section. You can perform many operations like adding, importing, exporting and editing products. You can also access product categories, option sets, and linked products. 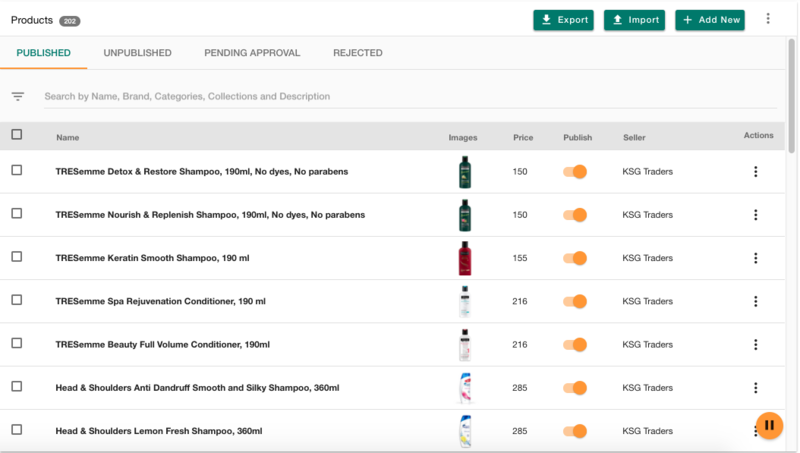 You can add products individually from admin panel or upload products in bulk with CSV. The products that you upload will get updated in the pending approval list first. Once the admin approves your product(s), it will be visible in the storefront. If any of the products are rejected by admin then those products are moved to the Rejected list. Go to Products > Products section in the admin panel. Click on the +Add new button. It will open a new page which is divided into multiple sections like General, Inventory, Options & Variants, SEO and Miscellaneous. Name: Enter the name of your product which would be visible to the customer on the storefront. Alias: Aliases are used to create unique product URL on your Storefront. Aliases are created automatically but you can always modify it to create an SEO friendly URL for the product. Description: Enter the description of your products. For example: If your product is a T-shirt then you can write about the type of fabric, color or any other quality of the product that you want your customers to know about. Images: Product images not only help in enhancing the product appearance on the store, but they also engage the customers. You can upload multiple images for a particular product by clicking on Add image. Click on Choose file to choose an image. Enter caption and tags and click on Insert image option. Price: Enter the price of the product in this field. Price is the selling price of the product at which you want to sell the product. It is a mandatory field. Compare Price: Compare price can be used to specify the list price of the product which could be manufacturer's suggested retail price (MSRP), or the recommended retail price (RRP), or the suggested retail price (SRP). On Storefront, if the price is lower than compare price then compare price is shown as stricken off. Collections: Collections can be used to group products across different categories together e.g. "Featured Products". A single product can be added to multiple collections according to its relevance. Brand: Brand is the identity of the product’s manufacturer. You can select one of the brands from the drop-down menu. You can manage the brands in Brands section. SKU: SKU or Stock-Keeping Unit is the unique identifier or code that is used to identify the product or any of its variants. Store owners can maintain their own SKU or use the SKU provided by their vendors. SKUs are used to manage and track inventory. They are also used in product mapping when integrating with other systems or marketplaces. Categories: Categories help you to categorize the products based on different qualities of the product. It arranges the products in a systematic manner so it is easier for the customers to manage and search the products. Weight: The exact weight including the packaging weight should be mentioned in this field. It helps the customer know the total weight of the product he would receive. For example, if somebody is buying a T-Shirt which individually weighs around 150 gm and with packaging, it weighs around 250 gm, then 250 gm would be the weight that you would enter in this field. Tax: From tax drop-down, you can choose which tax method would be applicable to the particular product. If there is a default tax configured for your products, then this field would be pre-populated with the default value. Publish: If you don’t want a product to be visible in the store or product is out of stock, but you might want to make it visible later, you can uncheck the Publish field. The product will no longer be visible in the store until you check the button again to make it live in the store again. Sort Order: Sort order field is used to set the specific sort order of your product. Default sort order is 0 for new products. By default, products are displayed in increasing sort order. The lower the number, the further up it will display. Inventory is the quantity of a particular product that is available for sale. Inventory tracking can help you avoid selling products that have run out of stock or let you know when you need to order or make more of your product. 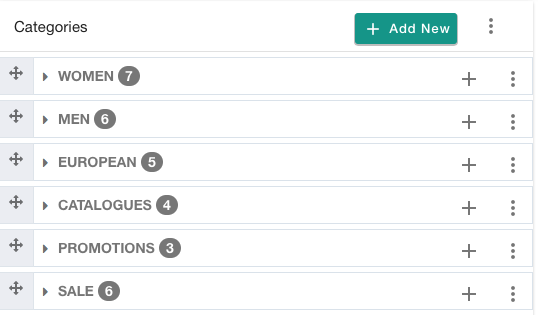 Add options and variants by either importing options from an option set or by adding your own set of options and variants. Options are the different properties of a product. For example, the size of a product is an option which can have multiple values like Small, Medium, Large. Click on Add option to add your own set of options and variants. Product variants are the different types and styles of a single product. For example, a T-Shirt with size small and the color red is a variant of product T-Shirt. 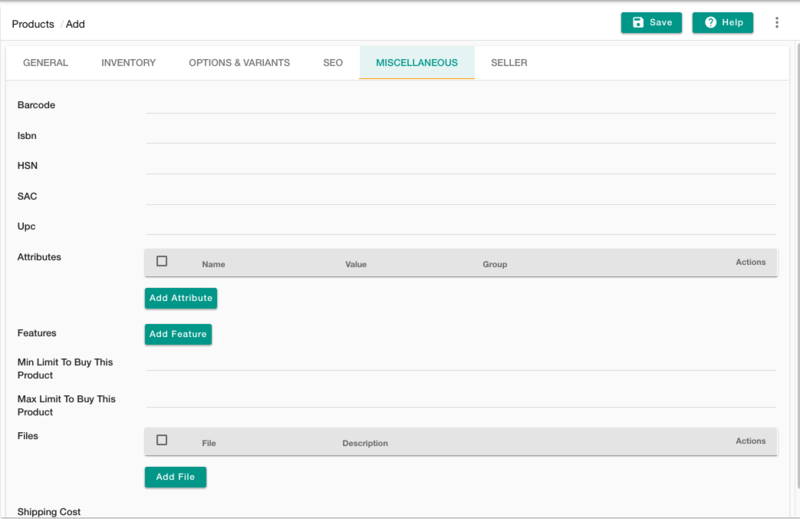 You can manually add variants to your product or you can also click on Automatically Generate Variants button. Search Engine Optimization is the activity of optimizing web pages or whole sites in order to make them more search engine-friendly, thus getting higher positions in search results. For making your store Search Engine Optimized, you just need to add SEO to your product and make some small modifications which will have a positive impact on your site's user experience and performance in organic (unpaid) search results. Miscellaneous contains the fields that are specifically related to your product. Barcode, ISBN, UPC, HSN and SAC code: Barcode can be used as another product identifier whereas ISBN & UPC codes are specifically related to books. HSN is a multipurpose international product nomenclature and SAC is Service Tariff Code for GST. Attributes: Attributes specify different properties of the product as key-value pairs. Attributes can be used to specify Technical Specification, Product Information or any other additional details about the product. Features: Features field can be used to specify the few unique selling features of the product. On the Storefront, you can use features to highlight few important aspects of the product so as to engage customers. Product feature describes the product from the product end-user perspective. Min Limit To Buy This Product: You can control the minimum limit for users to purchase the product. Max Limit To Buy This Product: You can control the maximum limit for users to purchase the product. Files: If you are selling a digital product or service, this field is where you can upload the files for your product. The downloadable link for the file would be available on the order summary page both at the front and back end, also the link would be available to the customer in the mail that he receives after placing the order. Shipping Cost: If there is any shipping cost involved for a product, this is the field where you can specify the shipping cost value. The shipping cost specified at product level will take higher priority than cost calculated using shipping methods. File: Click on Choose file and upload your product CSV file. Update By SKU: This option is used if products are updated using SKU for products/variants. By default, products are updated using the _id field. Do not create new categories: If you check this field, then new categories will not get created even if there are new categories listed in the file. 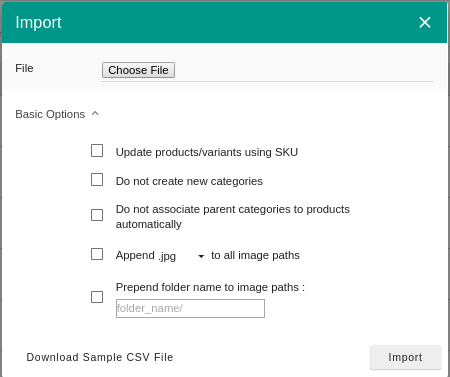 Do not associate parent category in products automatically: In product import, by default parent category gets associated with products even when only child category is given. However, if you check this field, then parent category will not be associated. Append extension after all images: You can select any extension, and that extension will be added/override with images path for all images. Prepend folder name to images path: You can prepend folder name before all images path related to ms.files in CSV if images were uploaded inside a folder in ms.files. Download Sample CSV file: You can download this file to know about the format of the CSV file and its fields. You can export your products to a .csv file if you want to create a backup, move your existing products to a new store, or edit your products in bulk using a spreadsheet. Any changes you make to the products in your product .csv file appears in your store's Product list if you import your product .csv file into your Storehippo admin. Go to Products > Products Section in Admin Panel. Columns: You can either choose to export all fields or selected fields. No filters: It will be selected by default. No filters will be applied to export by default. Use Current Filter: These are the filter(s) that are currently applied by the user. Filters for products are auto-populated in current filters. Select Filters: Use select filters to choose from already existing filters. For example, you can select category field equal to a certain category. Selecting this filter will export all the products belonging to the selected category. Number Of Records: You can specify the number of records to be exported. The current functionality allows you to export a maximum of 4000 products at a time. Start Marker: Start marker allows you to set the starting index for the export. The export will skip the number of products specified in the field. For example, if the store has 10 products and we specify 5 in start marker, then it will skip first 5 products & export remaining 5 products. After a product has been added, you can edit the details later and make changes to the complete profile of the product. There are two ways by which a product’s details can be edited after it has been saved. You can edit the product individually or edit products in bulk. 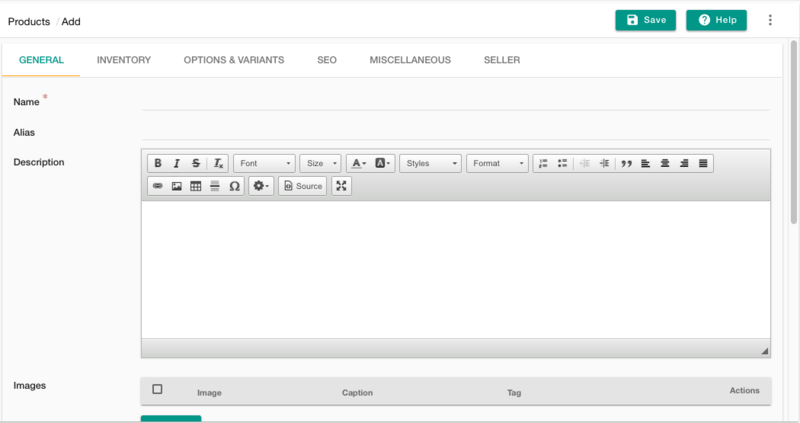 Click on the ellipsis button and choose to edit the product or just double click on the product that you wish to edit. You can make changes and save it. To edit products in bulk, export the CSV file as explained in the previous section, make changes to the details of the product and import the updated file. Categories are used to organize the products by the type of product. StoreHippo allows multi-level categories to that arranges your products in a hierarchical manner. Under categories section, you can only view categories but cannot create or edit category data. Options sets help to create choices for customers such as size, color, material etc so that customers are able to choose the different variant within the same product range. You can not only provide basic variants like size and color, but you can also add other variants as well. For example, in an apparel store if you are selling a T-shirt which is available in different size and colors, then a variation in size as well as colors, can be added to make it easier for customers to choose the product variant. 1. Provide option set name and add an option name, display name and choose the type to choose how the options should appear in your store for e.g. radio buttons or a drop-down menu. Note: You can check the required box if you want to make it mandatory for the customer to choose a variant. 2. When you have set all the fields, click on Add values button to define the value. We have chosen the color, so we will update the newly appeared fields according to color variants. Click on insert values to insert the value to save the value field. You can create multiple fields following the same method. 3. Choose the default value which would appear as a default selected variant. The customer can change the value later according to their preferred choice on the storefront. Click on insert options to create the option set. 1. Go to options and variants tab under products and select an option set that you want to import. 2. Click on import button. Clicking on import button will open up a page as shown below. 3. Based on the options that you have added, you can either automatically generate variants or you can add new variants manually. Add new variant manually: Clicking on add new variant manually will open up a form as shown below. Fill in all the details for variant as per the requirement and click on submit. Linked Products allow sellers in your store to specify different pricing for the same product. Linked Products share the same tags or categories as the current product but with different sellers and features. Go to Products > Linked Products section in your Admin Panel to manage the Linked Products. Product Name: Enter the name of your Product. Price: Enter the specified price of your product. Compare Price: Compare price can be used to specify the list price of the product which could be manufacturer's suggested retail price (MSRP), or the recommended retail price (RRP). On the Storefront, if the price is lower than compare price then compare price is shown as stricken off. Publish: This field allows you to make your product visible to the customers. Shipping Cost: It is the cost associated with the shipment of the product to its end user. Inventory Management: Inventory is the quantity of a particular product that is available for sale. Inventory Management can help you manage products that have run out of stock or let you know when you need to order or make more of your product. Inventory Allow Out Of Stock: This feature means that you can display out of stock products on a website when your inventory turns zero. When you activate out of stock button/checkbox this functionality is activated. Sort Order: Sort order field is used to set the specific sort order of your product. Seller: This field contains the name of the seller among different sellers selling the same product. Approve: It is for approval flow. Substores: Select the substores if you want this linked product to be visible only for those substores. Leave blank to show it for all substores. After filling the details click on the Save Button. Your Product is successfully added to the list of linked products. You can manage orders in order section. You can not only view your orders but you can also ship your orders, create and access returns, refunds, and fulfillment sections. You can manage your orders in Orders section. When a customer places an order and that order contains products from multiple sellers then, the order is automatically split into multiple orders. You can view only your orders. 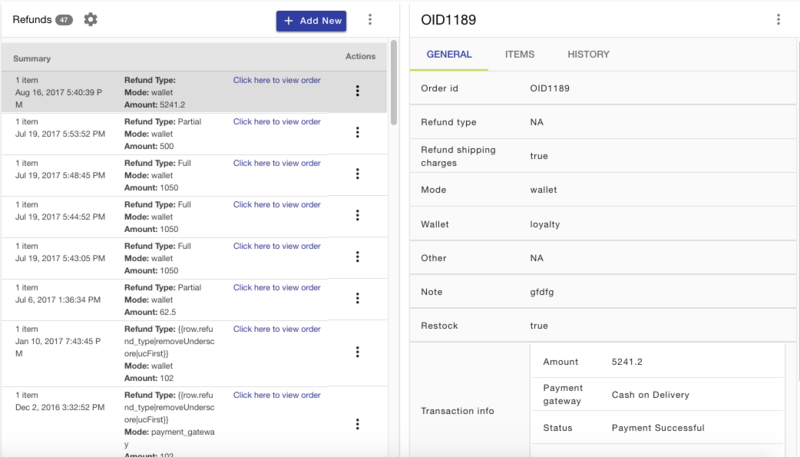 In the orders section, you can print invoice, review, cancel, ship and generate invoices for the orders. If you have shipped the order manually, then you can mark the order as shipped from the vertical ellipsis icon. On clicking, you would get the option to add the AWB Number and Logistic Provider for the order. You can change the pickup address that appears on the shipping label. This change can be done after clicking on the mark as shipped button. You can select whether to generate the shipping label or send an automated notification to the user with these details. Further, you can mark the order as delivered and an automated mail, as well as SMS, will be sent to the customer for delivery confirmation. You can also mark multiple shipped orders as "Delivered" in bulk. Once the invoice is generated for an order, you can print it by using 'Print Invoice' option. Click the ellipsis button and choose to Print Invoice. The invoice will open in pdf format in a new tab, from where you can download or directly print the invoice. Open the order for which invoice is to be generated, click on the ellipsis icon and select Generate invoice. To generate the invoice number manually, select Manually and enter the invoice number of your choice. 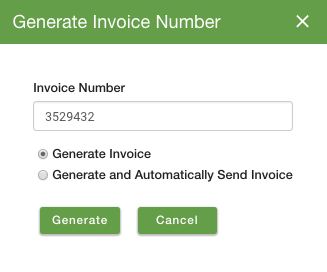 Else you can also generate the invoice number automatically where the system will auto-generate the next available invoice number. Here, you can choose either generate invoice only or generate and send (to customer) invoice. 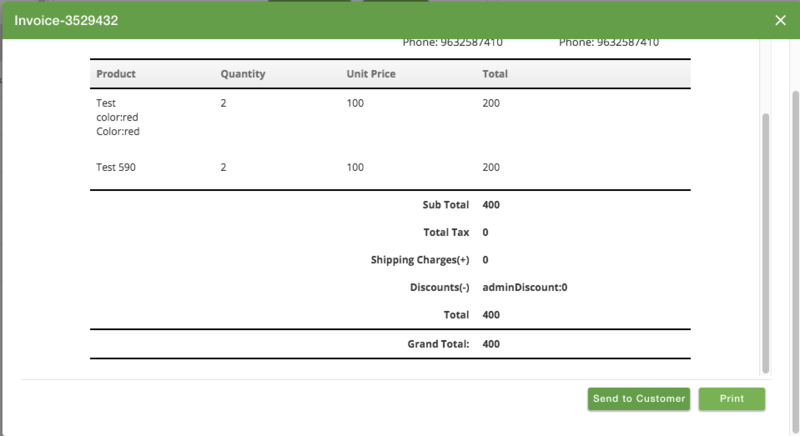 On generating the invoice, a pop-up will open showing the invoice preview, which you can print or send to the customer. By default the following invoice template will be shown. 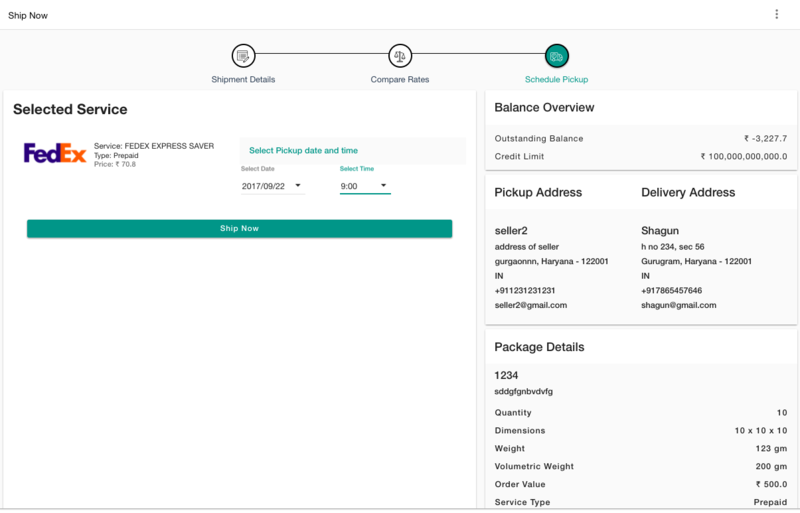 You can also generate invoices for multiple orders at the same time by selecting all the orders for which you want to generate the invoices. 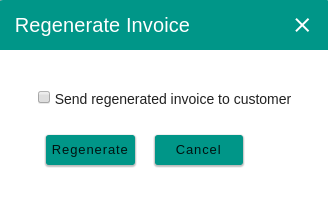 Once an invoice is generated for an order, and the invoice template is changed, or invoice is not up to the mark, then, you can regenerate the invoice by using 'Regenerate Invoice' option. You can do this by either clicking on the vertical ellipsis icon to get the 'Regenerate Invoice' option, or click on the order ID to open the order details in the right panel, there you can click on the ellipsis icon to get this option. Clicking on this option will first confirm whether you want to regenerate invoice or not, then, if you want to, it will open a pop-up where you can choose whether you want to send this regenerated invoice to customer or not . After regenerating, you can again print the invoice. Shipping labels are created for orders that are shipped either through Ship Now or Mark As Shipped functionality. To create a shipping label for an order, click on the ellipsis button and choose shipping label from the drop-down. A new tab will open the shipping label in pdf format and you can download it from there. 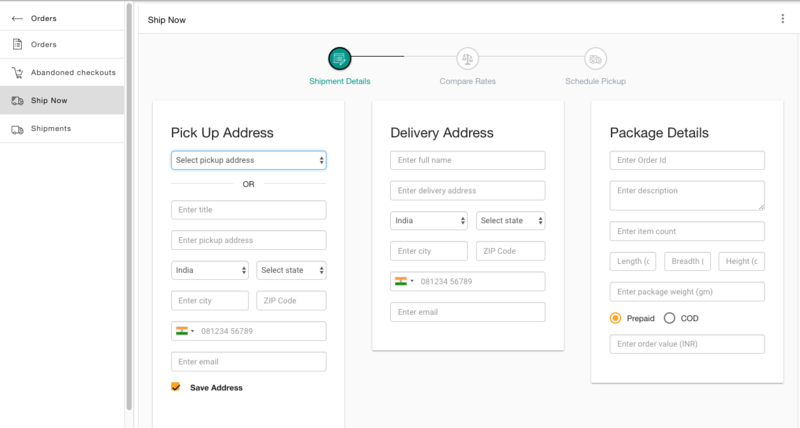 You can create shipments or ship an order manually by "Ship now" section. In "Ship now" section, all the details of the shipment are provided. You can compare and calculate rates and schedule pickup. In the Orders > Ship Now section in Admin Panel, you will be prompted to review the order details needed for the shipment. In this step, you can enter the pickup, delivery addresses, and package details. If you choose to ship from orders as explained in above section, the pickup and delivery address will be pre-populated. You can review it here. Pickup address: The pickup address is the address from where the pickup for a product is arranged. Enter the complete pickup address here or select the already saved address. You can also save the pickup address mentioned here and it will be stored in Store Location. Delivery address: The delivery address is the address of the customer where the product has to be delivered. Volumetric Weight: Volumetric weight is measured by taking into account the length, breadth, and height of the order[Packaging Included]. Packaging Weight: Packaging weight is the weight of the order that has been placed. One should keep in mind that the logistics provider charges the amount by taking into consideration whichever is greater- Volumetric Weight or Packaging Weight. In this step, rates of the different logistic provider are compared. 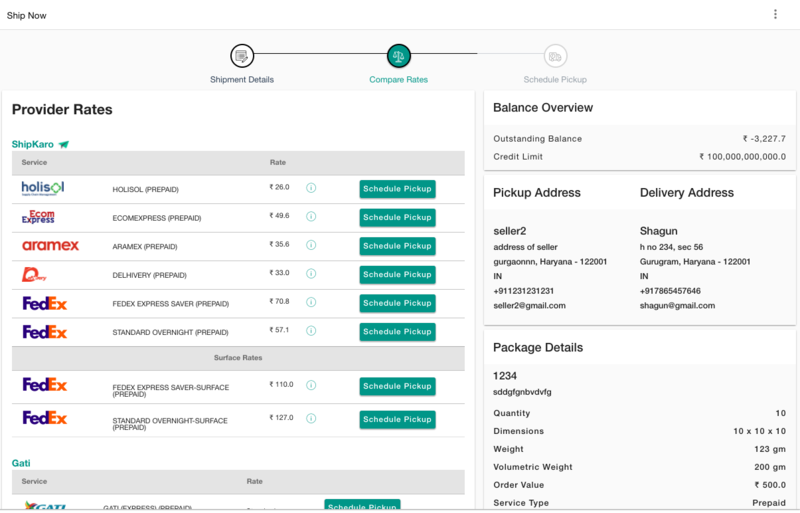 The rates include the StoreHippo integrated logistics providers as well as the providers integrated by the admin. Click on Schedule pickup to schedule the pickup by any desired service provider. After selecting a service provider, you can schedule the pickup. 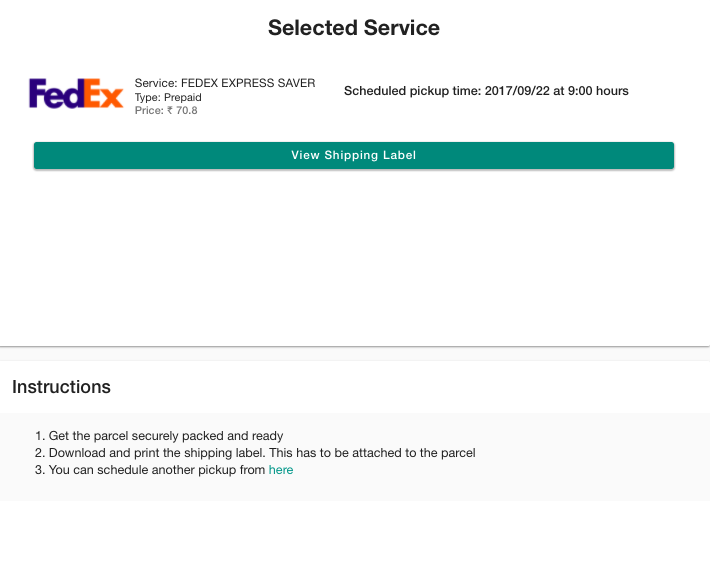 Select the pickup date and time so that the service person can pick up the product at the selected time. Fulfillments give a finer way to control the shipment of an order. You can create fulfillment for few or all items in an order. You can create fulfillment for few or all items in an order. That way you can divide your order into one or more parts which can be shipped independently. You can also create invoices for partial fulfillments. Go to Orders section in Admin Panel. Search for the order that you want to fulfill. Click on 'Create Fulfillment' command. Select the items and their quantities that you want to fulfill. Clicking on Fulfillment id will show the fulfillment details in a popup window as shown below. The return order request can be placed either by the customer from the front end or seller/admin from the admin panel. The return request can be placed only after the order has been delivered. 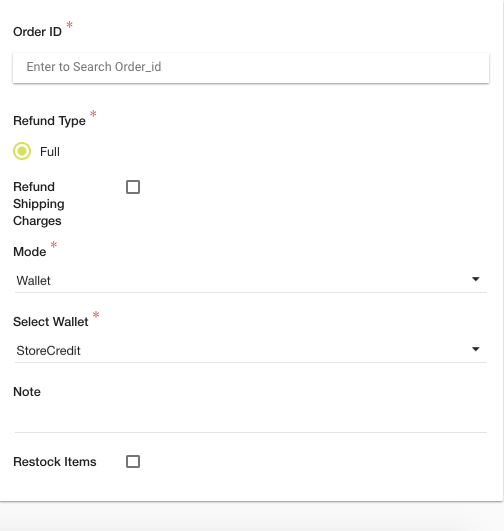 You can return an order from Returns section. All the returns are managed in Orders > Returns section of the admin panel. Order ID: Choose the order id of the order which you want to return from the drop-down. Return Type: You can return the order either full or partially. Full Order: The full order return type means that the order which was shipped to the customer is fully returned. Partial Order: The partial order return type means that the order which was shipped to the customer is returned partially. 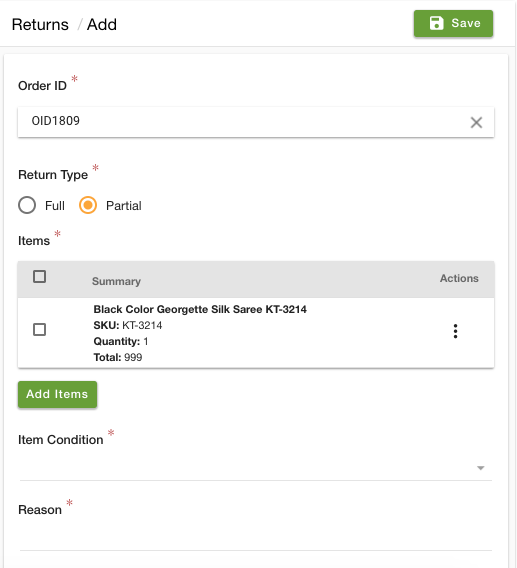 Items: Items are automatically populated in the add form as soon as you select the order ID when full order return type is chosen. Select items to be returned in case of the partial return type. Item condition: Select the condition of the item to be returned from the drop down. It is either Opened, Unopened or Damaged. 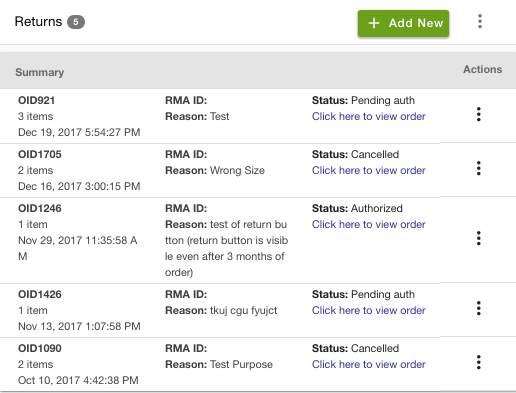 Reason: Specify a detailed reason for the order return. A refund is a record of the money returned to the customer, of the items(all or some), on an order which may or may not has been restocked. You can refund an order through Orders and Refunds section. An order is eligible for a refund only if it is either canceled or returned. In case of the return, you need to specify the RMA you want to refund. You can manage refunds from the Orders > Refunds section in Admin Panel. Only Cancelled orders can be refunded. Order ID: Select order id of the order that you want to refund from the drop down. Full Order: The full order refund type means that the order which was shipped to the customer is fully refunded. Partial Order: The partial order refund type means that the order which was shipped to the customer is refunded partially. Refund Shipping charges: Usually, shipping charges are not refunded if they are applied to any order. So, if someone wants to refund the shipping charges, he/she can check 'Refund Shipping Charges' checkbox. Wallets: It gives us a list of the available wallets to choose from so that the refunded amount is added to that wallet. In case no wallets are available in store, a default wallet named 'StoreCredit' is available. 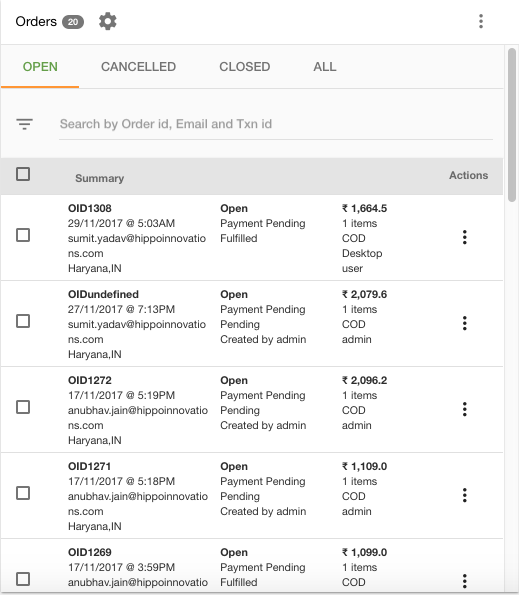 In case of orders created by admin from admin panel via add/duplicate order, there might be some problem in refund process because it does not have provision to add wallets yet. if payment is not done through wallets. the order is not split. shipping charges are applied to order and you want to refund them by checking the 'Refund Shipping Charges' checkbox or shipping charges are 0 and you are refunding the full order. Other: In some cases, the user can give his bank details or tell some other way in which he wants to refund. Once you have processed the refund, you can mark the order as refunded through 'Other' mode. Note: A text field which takes a reason for doing the refund as an input. Restock: A checkbox which needs to be checked in case update of the inventory is required. Additional charges and taxes will only be refunded if the refund process is initiated via payment gateway and cannot be refunded partially for now. After successful refund, a mail is sent to customer, seller, and admin. All the details about refund are saved in a separate 'Refunds' Section in the admin panel. 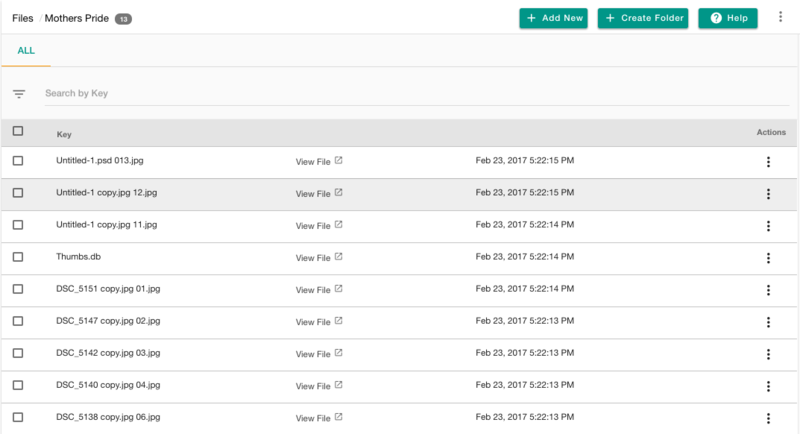 You can upload and manage files in Sites > Files section. The uploaded files can be referred in CSV files for product import and Product Descriptions. Files section allows you to upload files that you can use in product imports, static pages, theme widgets, product description, and in any entity field that supports HTML. Click on Add button in the top right corner. Clicking the button will open a new page. Drag and drop a single file or multiple files from your desktop in the highlighted area or simply click inside highlighted area and select files from a specific location on your hard drive. Once files are selected, click Save button. The file will now be added to file list with the file name mentioned under the key column. You can also check if the file is uploaded correctly by simply clicking on View File. When you click on view file, it opens the file in new window. Copy the URL from the browser navigation to get the full CDN URL of the file. If there are many files in the files section, you can organize the files using folders. One can create folders for different categories and keep files related to the same category in a particular folder. Click on Create Folder button from the top right corner on files entity listing page. A pop-up will open up. Enter the name of the folder in the folder field in the pop-up. Click on Create button. The newly created folder with the name entered in the folder field will appear at the top of your files listing page. To add Files to the folder, click on the Folder Name. Follow the same steps mentioned above in Adding Files. If you uploaded abc.jpg directly in the files section, then use "abc.jpg" in the image column of the CSV file. If you uploaded abc.jpg in xyz folder in the files section, then use "xyz/abc.jpg" in the image column of the CSV file. You can also use the full URL of the uploaded file in the image column of the CSV file. So, there's no need to upload the same image again and again. You just need to mention the name in .csv file and leave the rest on our great feature where your file with the same name or path will be automatically added. You have access to store locations where you can manage the location of your warehouse. You can also manage the taxes for your products. Store Locations are basically the physical locations from where you are operating your business. The store locations can be displayed on your website page or can become the pickup addresses that you can select from while shipping your orders. You can manage the Store Locations in Settings > Store Locations section in admin panel. If you want to show the store locations on your website page then you need to check mark the show on website field while adding or updating an address. All the store locations are available to choose from while shipping an order. StoreHippo provides the option to import addresses. If you have a list of store locations that you want to add to your store, you can use the import addresses in bulk using a simple CSV file. 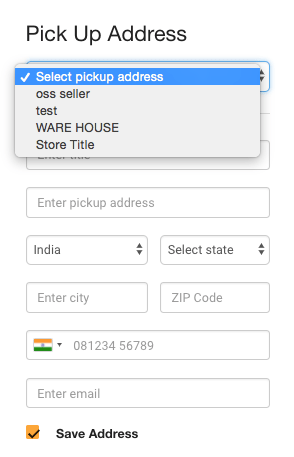 To import store addresses, click on the vertical ellipsis button and choose Import from the drop-down. Click on Choose file, and then select the CSV file that you created. For a sample CSV, you can download and view our customer CSV template. You can also export the users to get your existing users in a CSV file. If you wish to export your store locations, use the export option. Click on the ellipsis button and choose Export from the drop-down. StoreHippo allows you to set up a number of tax rules that you might need to charge on your sales varying with different countries and states. 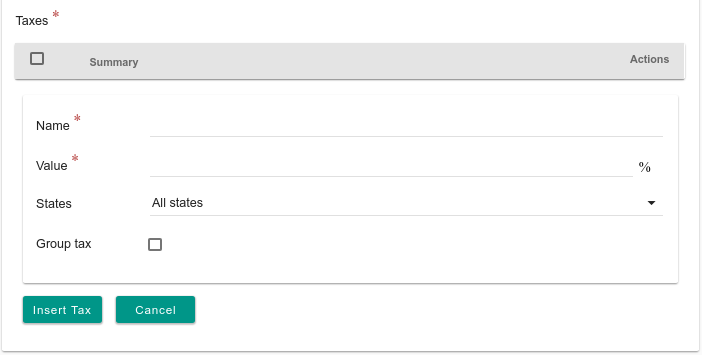 You can manage the tax rules in the Settings > Tax Rules section of the admin panel. Rule name: Enter the name of the tax rule. Country: Select a country for which you want to define the tax rule. Inclusive: By default, all the taxable amounts are configured to be inclusive of taxes. If you wish to make the taxable amounts exclusive of this tax, uncheck this field. Name: Enter the name of the tax. Value: Enter the value of the tax rate. States: You can define the states in which the tax is applicable in this field. You can define the tax to be applicable either in all states or specific states only or even excluding some specific states. Apply when: Different variants of the same product can have a different tax rate. To support that requirement, there is an extra condition to specify the price of the product. So you can define different tax rates based on the price of the product. For example, a product if sold below X amount might have a different tax than if the same product or its variant is sold for an amount above X. Also, there is a support to specify conditions for HSN/SAC codes. That allows you to reuse the same tax rules for multiple products or have a common global rule that applies to your entire catalog of products. Group tax: If the tax contains additional taxes, you need to check this field. A group tax is defined as a tax which constitutes additional taxes. For example, the Service Tax of India is 14% which is a group tax, comprises an additional 0.5% of Krishi Kalyan Cess and 0.5% of Swachh Bharat Cess, thus making the effective total rate as 15%. Name: Name of the additional tax. Value: Rate of the additional tax. Apply on: In most of the cases, the additional taxes are applied on net amount, however, if your additional tax needs to be applied on tax amount you can set the Apply on as Tax amount. Reports give you the quick glance of the statistics of your store. Reports section provides the overview of the data of your products which includes the recent orders, top customers, order summary, best selling product and monthly revenue etc. Logs provide the history of the events in your store determining when it took place, by whom and other information. In Imports logs section, sellers can keep a track of the product imports that in progress or completed. In Sellers section, you can view and update their profile. Seller profile contains the basic information of the seller such as email, name, status, website, address and bank details etc. You can also edit the profile by clicking on the Edit button and updating the information. In the seller ledger, all the transactions are present with the complete list of credit and debit entries. You can also filter the transactions by a time range. Transactions are generated for following actions. If a Product Listing Fee is defined by the admin, then a transaction will be created with the product listing fee for every product added. Product Listing Fee is applied even if the product is not approved yet. If a Product Selling Fee is defined by the admin, then a transaction will be created with the product selling fee for every product that is sold. If an order contains multiple products on which product selling fee is applicable then there will be multiple entries for one order, one for each product in the order. When an order is placed, the paid amount of the order will be credited to the seller. When an order is canceled, the paid amount of the order will be debited from seller's account. If the seller has used the shipping services to ship the product then the shipping charges will be debited from the seller's account. For COD orders, the amount of the order will be credited to the seller once the amount is received from logistics provider. You are responsible for generating the invoice to the customer. You are also responsible for charging the applicable taxes (VAT, GST etc.) on the product which will be applied to product selling price. The Seller Invoices section displays the list of paid and pending invoices for the sellers. You can also opt to pay directly from the Seller Invoice by clicking on the ellipsis button and chooseing the Pay option. Here you can select the payment option and click on Pay button which will be directed to the payment gateway. A transparent and detailed view of your transactions and corresponding amounts is provided through Seller Ledger. You can check your details and contact the admin for the release of your payout amount depending on the threshold or any other conditions applied to payout amount. You can get answers to your technical or admin related questions by raising a query in the Support segment. This sends your questions directly to the admin who would respond to it in due time.